You may not be familiar with a neti pot, a device that looks like an Aladdin’s Lamp and is used to irrigate (flush) the sinuses with a simple salt and water mixture. Washing with a neti pot helps everything from dry nose to runny nose, and hopefully you’ll get relief from using one instead of relying on over-the-counter or prescription nasal medications. This easy to-do list will help you use a neti pot effectively. NOTE: This is not a glamorous activity. Don’t be embarrassed! Disinfect the neti pot before using. You’ll want to wash and rinse your neti pot every time you use it to avoid introducing dust and germs into your nose. Hot water and soap are adequate, but some prefer to disinfect it with alcohol or a weak vinegar or bleach solution. No matter what you use, rinse well and dry completely. This part can be a bit messy, but it’s well worth it. Lean over a sink, and turn your head to the side. Your head should be almost parallel to the counter, with your chin slightly lower than your nose. Put the neti pot spout in the upper nostril far enough to ensure the saline solution cannot flow back out. Lift the pot slightly and let the solution run into the upper nostril. You’ll find that the saline and water will begin to run out the lower nostril. Use half the pot for each nostril. When you’re done, keep your head over the sink, turn your head upright, and blow your nose carefully, clearing out both nostrils at once. Clean the pot and put it away. Two main issues come up for inexperienced neti pot users. First, it’s difficult to remember to breathe through your mouth while using the pot. 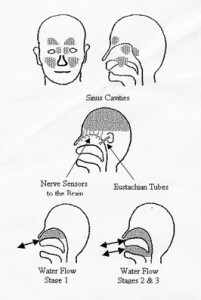 You need to close off your mouth and throat so the pot works in the nasal area only. If you try breathing through your nose, you’ll snort the saline, and it can be uncomfortable. If the saline drains out of your mouth instead of the lower nostril, raise your chin a little higher. We hope the neti pot works well for you! If you have any questions about using a neti pot, see the directions that came with it, or try YouTube to see how to do a sinus irrigation. Neti pots work well for athletes, especially those who may be outside during high-pollen times of day. On Wednesday, March 5, at 7 p.m. at Infinite Health in Charlotte, Dr. Smith and health coach Lisa Roberts will talk about oxidative stress and how it affects your athletic activity and recovery. They will offer tips to recognize and reduce this particular condition for your best performance. Whether you’re a runner, cyclist, swimmer, or a regular exerciser, this special presentation will help you better understand your health and fitness regimen. Register to attend here. My life is forever changed by using a neti pot on a daily basis. Now I no longer have a reason to worry that I’ll be catching a cold at the slightest sign of stuffiness. And as a singer, keeping my sinus cavities sparkly clean helps to produce a nice resonant tone.